This year I had the good fortune of being able to get out to the 2010 International CES, the world’s largest tradeshow for consumer technology. Set amidst the expansive Las Vegas Convention Center, some 20,000 new products are on show to a global audience of geeks, buyers, analysts and media luminaries. While one gets a little toxic immersing oneself in four days of meetings, conference sessions and tradeshow booths, this year did not disappoint. A lot of “stuff” got launched this year, from 3D technology, mobile DTV, tablets, netbooks, eReaders, health apps, connected TVs, embedded Internet technologies and new green technologies. Here’s some ramblings (and rants) that capture some of the technologies and trends that caught my attention. 3D: I’ve been mapped! Again! With Avatar now in theatres and a plethora of 3D camera and panel offerings all over the show floor, this could be called the year that 3D exploded into the market at CES. 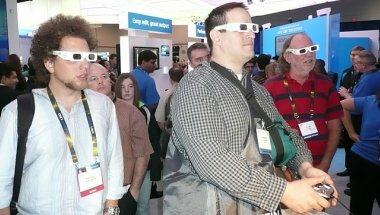 But one of the more striking technologies in the 3D market is something you would be more likely to miss as it drives by. Navteq, the Nokia mapping subsidiary has begun outfitting its data collection vehicles with a system called Navteq True which will be used to construct richly detailed 3D models and maps starting with the United States. Working in concert with the lasers are high-resolution panoramic cameras and devices called Inertial Measurement Units (IMUs) that can precisely gauge road curvature and slope. Clearly when this technology is rolling through your neighborhood there will be nowhere to hide as the system captures 1.5 million 3D data points per second from features as far as 150 meters away and works even when the data collection vehicle is traveling at highway speeds. While Google Maps with its introduction of turn-by-turn functionality has disrupted the comfortable market position Navteq and Tele Atlas once held, Microsoft’s announcement that they will license images in the Navteq 3D format for their new Bing search engine is encouraging. Be sure to clean up the front yard before the Navteq truck rolls by. One look at Cannondale’s new technology is further proof we are entering into a very interesting design period – a digital renaissance where mechanics will be increasingly displaced by electronics. But what’s particularly exciting is that components such as accelerometers, sensors and microcontrollers will be finding their way into everyday stuff at a pace we’ve never see before. Cannondale’s Simon technology is a fully electronic adjustable suspension system for mountain bikes. Sporting five microprocessors, the system does away with all the complex mechanical parts found in a traditional high-end suspension system (such as springs, valves, needles and knobs) and replaces it with an electro-mechanical device. The rider can vary not only set suspension strength but also ride height instantly based on road conditions via a handlebar mounted LCD panel. What I find particularly interesting is that Cannondale seems to be looking at this type of innovation through two lenses. Sure, there’s the obvious improved product experience. But this system also reduces potential service issues in the channel as their products become more complex. As more and more advanced technology gets embedded (in areas such as bike suspension) the knowledge of the person in the local bike shop needs to be much more advanced as well. For instance, if you don’t know how to properly adjust the suspension settings, you could easily wreck a finely built, expensive bike. Further thought here: think about the workforce you need to sell and service your technology and how can you innovate your way out of this problem. For a really technical discussion of how the Simon system works, click here. Leverage the provider ecosystem (from clinicians to HMO’s to governments) to affect lasting behavioural change. Apps. part 2: Sure they can save you from a heart attack… But can they really save Detroit? It’s been a rough few years for the American auto industry as they seek to find their way out of what has been a dearth of consumer-valued innovation. As more and more cognitive research piles up to suggest we fail badly at multitasking, Detroit is packing in yet more distractions into our daily commute. They have clearly embraced the concept of “living in your car” (also known as commuting in GTA traffic). While I (cynically) remember Mercedes’ CEO at CES six years ago heralding the birth of “computers that people drive,” I have to admit there is more substance to what Detroit is pushing here. OEM’s such as Ford are clearly trying to get on the right side of the innovation in mobile before they get bashed by a host of aftermarket players. Most notable was the presence of Ford and Microsoft who came out swinging hard with the Sync in-car connectivity system. Their new Sync App Ecosystem announced at CES exposes software libraries designed to allow any Bluetooth device to communicate with their vehicles. Ford claims that applications will be able to write to this Sync display. The car will also read text to speech, receive voice commands and even allow you to read data from the car. I sure hope this eventually helps drivers decode what all those mysterious trouble lights mean on the dash and whether you should care. Also in store are integrated web browsers with 3G and 4G modems that turn the vehicle into a personal moving WiFi hotspot which should be capable of pushing any flat rate data plan to its limits. Happy motoring. Power: Who’s counting the kilowatts and the carbon? As I walked to meetings around CES and toured the show floor, I was struck by what appears to be a tsunami of new power-sucking gadgets and gizmos that would make Tom Rand’s head spin (Tom is our resident green guru and Cleantech Practice Lead at MaRS). Even I – an avowed technology lover who has been known to embrace my inner geek – was stuck by the amount of STUFF that we are adding to the planet. Just because Panasonic’s engineers can produce a 152-inch plasma doesn’t mean we should be marketing them to the masses. I overheard a staffer in the Panasonic booth bragging that the only (current) way to ship this unit safely is via specially equipped 747-air cargo jet (the panel enters through the nose of the aircraft). One is left to wonder about the real costs of running all this technology as it moves everywhere – to homes, cars, offices and data centres across the globe. I recently spoke with an industry executive who was commenting on the relative costs of key components of his company’s SaaS cloud-based software. While his organization has enjoyed a free-fall in computing and storage costs, the one area where Moore’s Law is not cutting his organization any slack is power. As we push more of our IT infrastructure into the cloud for the likes of Amazon and Google to deal with, we’re seeing power become much more strategic. Rapid growth in the data centre industry is projected to require two new large power plants per year just to keep pace with the expected demand growth, according to the United States Federal Energy Regulatory Commission. So it’s not surprising to see Google investing in everything from solar panel rooftops to specialized properties with waterfalls that provide a dependable source of hydroelectric power. You may recall they just last week filed for authority to buy and sell electricity in the wholesale market to help manage their huge energy needs. The irony here is that a lot of the gadgets and gizmos we’re adding to the mix at CES are fueling this data centre sprawl. While I am encouraged by industry consortiums such as the ZigBee Alliance helping push standards and visibility for start-ups in this area, we need some creative ways for the industry as a whole to push energy management applications that help us understand and manage our power consumption. Canadian start-ups such as Regen Energy and Energy Aware appear very well positioned to pounce on these opportunities. Perhaps it will be Google that really moves things completely mainstream. After all, this was the year I will forever remember I saw washers and microwaves running the Android operating system on the CES show floor. Despite these seemingly stranded inventions, what I could see versus previous years I attended, CES 2010 seemed to be more focused on making the thousands of component technologies we invented in the last decade work better together as a system than it was about inventing a lot of new technologies that don’t fit in to this new order. Perhaps the industry is getting wise in its old age as it appears to be following the old axiom: fewer starts… better finishes. Viva CES!